New focus on the highest quality qualifications and more information to be published in transparent school league tables. The Department for Education today announced that only the highest quality qualifications will be included in new, transparent school league tables. Today’s reforms follow Professor Alison Wolf’s review of vocational education. They will ensure schools focus on valued qualifications that make it easier for young people to enter good jobs or go on to higher education. All 14-16 qualifications currently count in performance tables whether or not they include external assessment. From 2014 only GCSEs and valued vocational qualifications that meet strict new criteria will be recognised in the tables. All these qualifications will count equally. At the moment, some qualifications are worth as much as six GCSEs in the tables. Schools will retain the freedom to offer any qualification approved for 14- to 16-year-olds. Teachers will still be able to use their professional judgement to offer the qualifications which they believe are right for their pupils. But only the most rigorous will count in league tables. A consultation, to run until the end of September, will help define the rules governing high-quality qualifications. We propose that all full-course GCSEs, established iGCSEs and AS levels should continue to count in the tables. They have a proven track record - only qualifications that have been taught for at least two years with good levels of take-up among 14-16 year olds should be included. They offer pupils progression into a broad range of qualifications post-16 rather than a limited number in one or two occupational areas. They are the size of a GCSE or bigger. They have a substantial proportion of external assessment. They have grades such as A*-G (those with simple pass or fail results will be excluded). When the consultation ends a list of qualifications which will feature in future performance tables will be drawn up. In order to ensure that students are encouraged to follow a balanced curriculum which encourages progress, only two non-GCSEs will be allowed to count towards the existing five A*-C GCSE indicators. The Wolf Report demonstrated that the current performance table system creates perverse incentives. Schools have been tempted to teach qualifications which attract the most points in the performance tables - not the qualifications that will support young people to progress. The number of so-called equivalent qualifications taken in schools up to age 16 has exploded in recent years - from 15,000 in 2004 to 575,000 in 2010. There are 4827 qualifications currently approved to be taught to 14- to 16-year-olds. These are listed in the Section 96 section of this website. In 2009-10, 125,367 students achieved Level 1 (grades D to G) in so-called equivalent qualifications, up from 11,007 in 2003-04. In 2009-10, 462,182 students achieved Level 2 (grades A* to C) in so-called equivalent qualifications, including BTECs, up from 1882 in 2003-04. Pupils need to acquire the broad skills which will enable them to progress in the short term, and to thrive over a lifetime of worldwide economic and industrial change. The Government needs to give schools every incentive possible to offer the programmes and qualifications which will achieve this end. In recent years though, schools have been under enormous pressure to pile up league table points. When any qualification under the English sun can contribute these, the pernicious effects are obvious. We need a single list of good qualifications which all have the same key structural characteristics, but cover a wide range of content. They need to be stretching, standardised, and to fit easily into a typical pupil’s programme and into a school’s overall timetable. Young people should be taking only the best qualifications in academic and vocational subjects that allow them to progress. Reforming the league tables so that they include only those qualifications that allow young people to maximise their potential is long overdue. The Department for Education’s annual Statement of Intent, published today, sets out the key indicators against which a school’s performance will be judged. This data will be published in January 2012 alongside a wider set of information, including school spending and pupil cohort data, as part of the Government’s commitment to greater transparency in January 2012. The 2011 school league tables will highlight the performance and progress of disadvantaged groups compared with other pupils. This will create a powerful incentive to narrow the gap in achievement between richer and poorer pupils. The league tables will also include attainment data, progress measures and an extensive range of additional information on progress made by low, medium and high attainers. There will also be data on those receiving free school meals and looked-after children. Together this will place a much greater focus on what schools are doing to help all their pupils fulfil their potential. Parents want more information so they can judge schools’ performance. The changes we have made mean that parents will have a complete picture of their local schools so they can choose the right school for their child. These changes will also ensure schools do an even better job in helping vulnerable children to succeed. The Statement of Intent states that the make-up of the English Baccalaureate - a mark of achievement for GCSE-stage pupils - will stay the same. Pupils’ results will count towards the EBacc measure if they achieve a C or better in each of English, maths, geography or history, the sciences and a language (modern or ancient). The qualifications consultation document can be on the consultations section of this website. The closing date for comments is 30 September. Final characteristics of high-quality qualifications will be announced in autumn 2011. 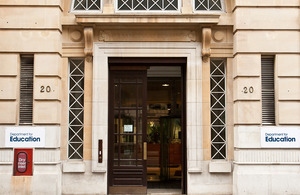 Schools are expected to teach high-quality qualifications from September 2012. This will then be reflected in 2014 tables. Narrowing the gaps - performance of pupils on Free School Meals and Children Looked After compared with others in the school. Value added - showing progress pupils have made between KS2 and KS4 and in English Baccalaureate subject areas. Performance of pupils with low, middle and high prior attainment. Information on prior attainment of the cohort whose results are being reported in the tables. Performance information on small schools/cohorts - previously, we didn’t publish data relating to 10 or fewer pupils. This threshold has been reduced to 5. Low attainers - those below Level 4 in Key Stage 2 tests. Middle attainers - those at Level 4 in Key Stage 2 tests. High attainers - those above Level 4 in Key Stage 2 tests. Low attainers - those below Level 2 at Key Stage 1. Middle attainers - those at Level 2 at Key Stage 1. High attainers - those above Level 2 at Key Stage 1. English: a C grade or higher in GCSE English or enter both GCSE English language and GCSE English literature and achieve a C or better in GCSE English language. Mathematics: a C or better in GCSE maths or additional maths. Science: enter all three single GCSE sciences and achieve C or better in two of them or achieve a C or better in both science and additional science GCSEs. History or geography: a C or better in GCSE. Languages: a C or better in one GCSE modern or ancient foreign language. A pass in the relevant AS level taken before the end of Key Stage 4. A C grade or better in an accredited version of an existing CIE or Edexcel iGCSE. Ofqual has formally accredited these as Level 1/Level 2 Certificates. Similar newly-developed qualifications will be considered for tables’ eligibility under the process to be consulted on described above. (No candidates are sitting any newly-developed qualifications this year so this will not affect the 2011 tables).